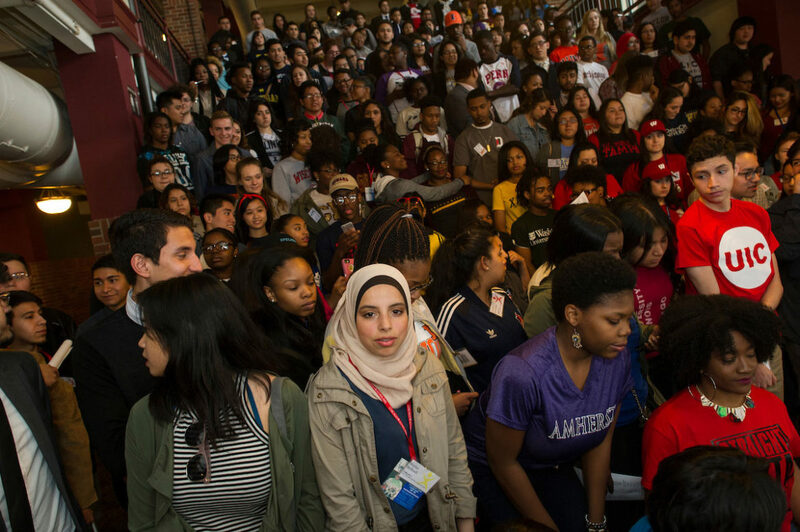 Hundreds of high school seniors gather to announce where they’ll be attending college at a Chicago Scholars celebration on May 3, 2016. My mother worked as a telephone operator and didn’t have the money to pay the $3,000 in yearly tuition. But the cost wasn’t a barrier for me, because I was considered a low-income student and qualified for financial aid. A large percentage of these students are African American and Latino. For these students of color, Illinois’ system of higher education reinforces racial inequality, prevents social mobility and widens the chasm between the haves and have-nots. While a staggering number of high school graduates have been leaving the state to attend college elsewhere (Illinois ranks second to worst in the nation for net outward migration of college freshmen, according to 2014 data), many low-income students don’t have that option. Instead, a dismaying number are being pushed out of the system entirely and being denied pathways to college. –Those cuts left more than 160,000 low-income students–about half of all those eligible–without much-needed state tuition grants in 2016. The impact on students of color was significant, since more than half of black and Latino undergraduates at public universities rely on those grants from the state’s Monetary Award Program. There’s real evidence of programs that work toward that goal. Colleges and universities across the country, and some progressive states, are making college more affordable by funding scholarships, offering free tuition, and streamlining transfers for students moving from community college to four-year colleges and universities. Students who attend a community college for their first two years can save substantially on overall college costs. The City Colleges of Chicago STAR Scholarship Program, which provides free tuition to college-ready Chicago Public Schools students—many of them undocumented–has since forged a partnership with 20 area colleges and universities to streamline transfers and provide scholarships for transfer students. Kyle P. Westbrook is the founding executive director of Partnership for College Completion, a nonprofit that champions policies and practices focused on equity in higher education. You can contact him at Kwestbrook@partnershipfcc.org. Many of the city’s racial disparities in 2018 are all too similar to those of 1968, when a federal commission analyzed the causes of racial tensions in cities across the country. In its first year, the Chicago Star Scholarship was most helpful to public school students who didn’t qualify for federal financial aid.